T1International is a non-profit advocating for affordable, accessible diabetes care worldwide. 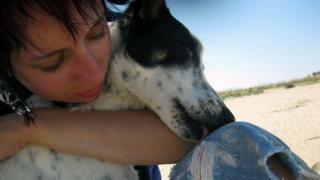 Founder Elizabeth Rowley is an American who now lives in the UK. As a T1 diabetic herself, Ms Rowley has first-hand experience navigating both health systems. She describes the US system as "convoluted", with profits happening at all levels in between. "People spend most of their life in fear of losing their insurance, of running out of insulin and the cost going up, or of having to stay in terrible jobs or relationships to ensure they keep their health insurance coverage," Ms Rowley tells me. "That's the best case scenario. "Worst case, folks are rationing insulin which has led to many reported deaths and excruciating complications. 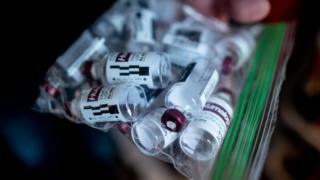 People are buying and sharing insulin from people online they have never met, having to choose between buying food, paying rent, or taking their medicine." 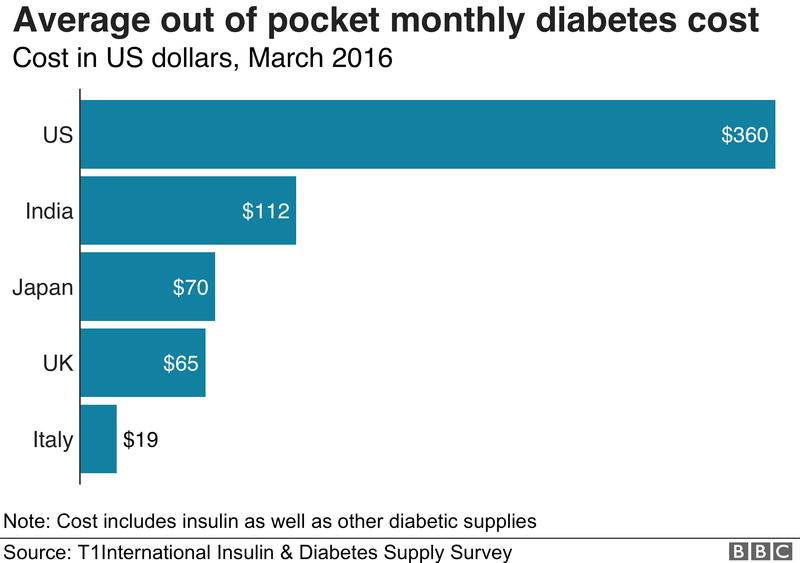 Diabetics in the US pay on average over $210 each month for insulin, according to a T1International 2016 survey, compared to less than $50 in India or nothing at all in some European countries. "In the UK, I walked into the pharmacy, and with my medical exemption card, picked up my essential medicines. 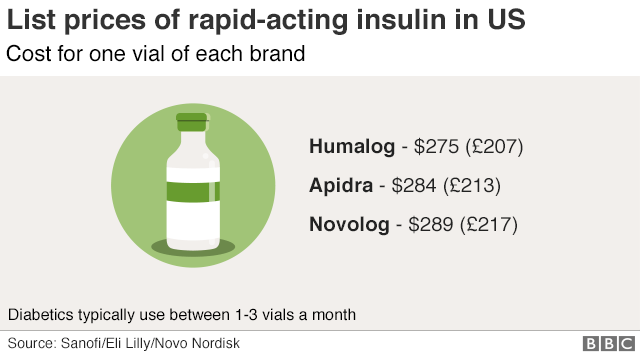 While the NHS is still overpaying for insulin, the cost it pays is miniscule compared to what people in the US must pay." Ms Rowley acknowledges these other systems aren't perfect - but to her, they are still far better for patients. 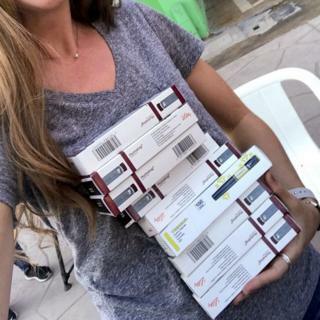 Lauren Hyre, 30, an Arizona-based advocate for T1International, knows first hand the fears of accessing insulin in the US system. She's struggled with it for two-thirds of her life. Her father passed away when she was nine and his company cut off the family's health insurance. Before Obamacare, diabetics could be denied insurance, and so Ms Hyre was without coverage for years. Living in Indiana, a state without expanded health assistance programmes, she also didn't qualify for any government help. 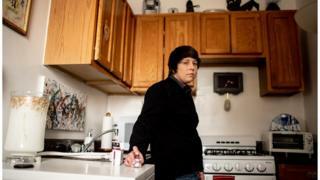 For years, Ms Hyre depended upon expired vials of insulin from her doctor's office and making trips to Canada to buy it at an affordable cost. Ms Mackey was already in California for work, and so her tram ride from San Diego to Tijuana, Mexico, cost $5, round-trip. 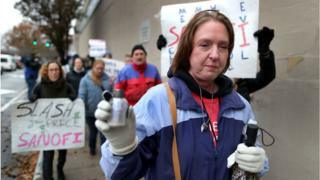 A six-month supply of insulin set her back $100, a lot lower than the $1,300 cost if purchased through her insurance. But her relief soon turned to aggravation. Even if she had flown from her home in Philadelphia, buying insulin across the border would have saved her money. "I was angry that I had to go to Mexico in the first place to get a drug that keeps me alive. I live right next to a [US pharmacy], yet had to travel 3,000 miles to another country to get affordable insulin." Dr William Cefalu, the ADA's chief scientific, medical and mission officer, says a lack of transparency is at the root of the issue. "The system is dysfunctional. 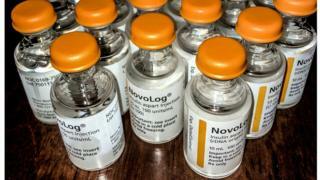 There are issues at each level, at each stakeholder in the insulin supply chain," he says. "We can't point the finger at one particular entity." Competition would be the best way to bring prices down, so why hasn't that happened yet? Unlike chemical drugs, which can be simply replicated, insulin is a biological material - made up of proteins synthesised through a cell line that's unique to each formula. Novo Nordisk, Eli Lilly and Sanofi's insulins are all slightly different in this way, and no "generic" or un-branded copy could be made without accessing these companies' patented materials and processes. In December, the FDA announced that the agency would reclassify insulin as a "biological product" by 2020, in what the FDA commissioner called a "watershed moment for insulin". These so-called biologics will then have an easier pathway to approval than before, promoting the development of "products that are biosimilar to, or interchangeable with" existing insulin. Insulin isn't the only drug affected by the tangled web of regulations and closed-door industry dynamics, but it is one of the few with life-or-death consequences attached to its price tag. For Ms Marston, it's hard to see why insulin was ever treated like other medications. "It's a natural hormone that everybody else's bodies make that ours don't," she says. "There should be price caps on it just like everything else that's required for life: your water bill, your electric bill. Arguably those things are even less required than Humalog." 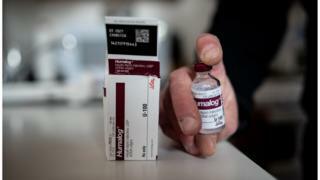 Eli Lilly has announced it would be offering a new "generic" version of Humalog for half the cost. 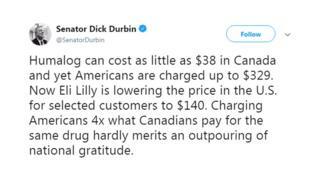 But the $137 price tag for this new generic is still steep - and significantly above what other countries pay for the same insulin. It's a move that may reduce what some pay at the pharmacy, but one that fails to address the systemic issues around insulin pricing. The Affordable Drug Manufacturing Act would order the Department of Health and Human Services to create a new office focusing on manufacturing generic drugs "in cases where the market has failed" in order to "jump-start" competition. "In an instant, they were faced with having to pay list prices and could not do that, and that is why they died. "If even one person has to pay list price, that's not fair," Ms Marston says. "It's really someone having a gun to your head and saying: Your money or your life."